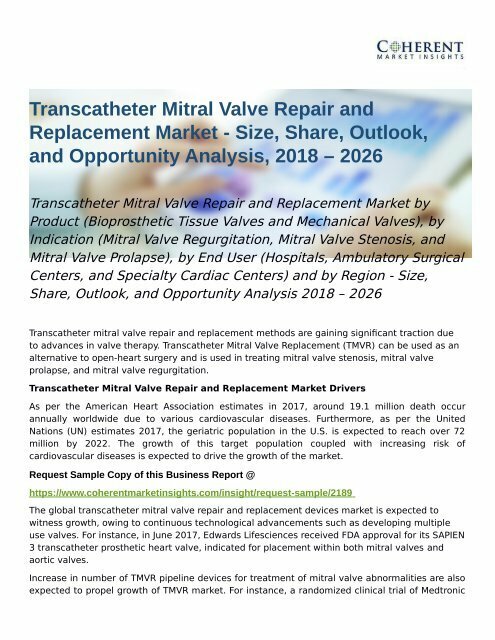 The global transcatheter mitral valve repair and replacement devices market is expected to witness growth, owing to continuous technological advancements such as developing multiple use valves. For instance, in June 2017, Edwards Lifesciences received FDA approval for its SAPIEN 3 transcatheter prosthetic heart valve, indicated for placement within both mitral valves and aortic valves. Increase in number of TMVR pipeline devices for treatment of mitral valve abnormalities are also expected to propel growth of TMVR market. For instance, a randomized clinical trial of Medtronic Intrepid Transcatheter Mitral Valve Replacement System, sponsored by Medtronic Cardiovascular is ongoing for treating mitral valve regurgitation and is estimated to complete in October 2025.